Red Oak Trees: If you have noticed your Red Oaks starting to thin out in the foliage. This could be a serious sign that you might have oak wilt infecting your oak trees. On red oak trees, you will have wilting of the leaf tips turning a brown chlorosis color wilting backward towards the veins. If you need Oak Wilt treatment on your tree in Fort Worth, TX, contact us today for a free consultation. You might notice this on several leaves or branches, at times one side of the tree or the full tree's canopy turning brown. There are other reasons that can cause your red oak trees to wilt, bacterial leaf scorch another known name (BLS), Insects borer beetles can do the same. It’s important to get a lab test done with Texas A&M to confirm if it is oak wilt. Call today 817-502-9402 to help your trees. Spotting Oak Wilt is the first step. We can help! Live Oak’s Are easier to identify for oak wilt. You will see the unmistakable vein part of the leaf turning brown and in some cases even dark green while the rest of the leaf turns brown. This condition is called veinal neurosis and it’s fairly simple to identify. It is highly recommended to call a Fort Worth arborist to diagnosed for oak wilt. A sample lab test can confirm if you have Oak Wilt disease on your live oaks trees. Red oaks are almost always the reason why oak wilt is spread. Red oaks species is vulnerable to the oak wilt disease. As fungal mats acquire underneath the bark system the sap eating (Nitidulid beetles), will get contaminated and fly off to other healthy trees. This is one of the main whys other red and Live Oak tree contract the tree disease. Unfortunately, almost all red oak trees will die once contracting the Oak Wilt Pathogen. On red oaks, it can also be transmitted through the root system as trees live in a mott and will spread tree disease to one another with the pathogen. In addition with Live Oaks, it is normally spread through the root system as live oaks normally live in big groups together. 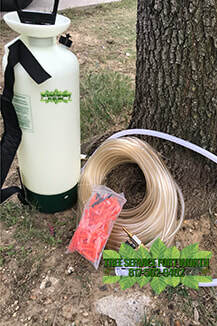 We give you the right plan to fight against Oak Wilt Spread by using Successful treatments of Oak Wilt as the prevention method in Fort Worth, TX. Although if unsuccessful, the other option to treat this aggressive pathogen would be to REMOVE the infected tree. Perform an aggressive root barrier to include trenching down at least 4 feet to sever the root system from contaminated other healthy trees. Stump grinding the root flare until hitting dirt underneath is important. In addition, removing all grained wood mass or shavings from the property is critical. It is important NOT to keep any of the firewood from these infected oak wilt trees in Fort Worth or other areas in Texas. Last and as important you will have to remove all leaves from infected trees off your property. Keep in mind that leaves carry the disease so when mowing to will mulch turning leaves into compost, with rains later that years your other healthy trees will also get the disease. Call us today at (817) 502-9402 for a free consultation from a Certified Arborist. Treatment Prevention of Oak Wilt, Keeping Your Tree Safe & Healthy! It is imperative to treat the healthy trees that are not showing signs of the oak will pathogen within the property. Several different fungicides have been proven successful in preventing Oak Wilt. The traditional way to treat for Oak Wilt is to expose the root flare and use trunk tree injections with Alamo propiconazole fungicide. Re-treatment might be necessary the following year to ensure the longevity and overall health of your Red and Live oak trees. Systemic the deep root fertilization is also a very recommended option to keeping your trees vigorous and healthy to be able to combat any tree disease to include Oak Wilt or insects. Updated on November 14, 2018 by Tree Service Fort Worth.